A rare case of heterotaxy syndrome with agenesis of the head and uncinate process of the pancreas. Heterotaxy syndrome is a rare complex syndrome characterized by cardiac and extra cardiac congenital malformations. The syndrome is divided into two main groups; right isomerism (Ivemark syndrome, asplenia) and left isomerism (polysplenia syndrome). Here we report a polysplenia syndrome with agenesis of head and uncinate process of the pancreas in a 52 year old woman who admitted to our clinic with complaints of weakness, lumbalgia, abdominal distention and constipation. Polysplenia, Heterotaxy syndrome, Agenesis of pancreatic head. Most part of the human body is arranged symmetrically with respect to the sagittal plane. Asymmetric organs develop as midline structures and then become lateralized. Normal position of these organs named as situs solitus, while the mirror image layout called as situs inversus. Heterotaxy syndrome occurs when embryonic development arrested to perform normal left-right asymmetry [1-4]. Heterotaxy syndrome is a rare and complex disorder with an incidence of 1/8000- 1/25000 live births . We aimed to present a polysplenia syndrome with agenesis of head and uncinate process of the pancreas that we have not been previously reported in literature. A 52 year old woman was admitted to our clinic with complaints of weakness, lumbalgia, abdominal distension and constipation for four weeks. She has already been diagnosed as situs ambiguous 12 years ago and a cardiac pacemaker has been implanted for sick sinus syndrome 8 years ago. On physical examination, she was 160 cm tall and her weight was 65 kg. Vital signs and other physical examination findings were normal. Results of the laboratory assessments were as follows: white blood cell count: 9.9 K/uL (4,0-10,0 K/uL), hemoglobin:12,2 g/dl (12-16 g/dL), platelet count: 299 K/uL (N:140-400 K/uL), C-reactive protein: 27.9 mg/L (0-5 mg/L), erythrocyte sedimentation rate: 101 mm/h (<30 mm/h), plasma glucose: 102 mg/dL, HBA1c: 5.4%, aspartate transaminase: 142 IU/L (5-34 IU/L), alanine transaminase: 62 IU/L (0-33 IU/L), alkaline phosphatase: 130 IU/L (40-150 IU/L), gamma-glutamyl transpherase: 145 IU/L (9-36 IU/L), total protein:10 gr/dL (6,2-8,1 g/dL), albumin: 3 gr/dL (3,4-4,8 g/dL), total billirubine: 0.54 mg/dL (<1.2 mg/dL ), direct billirubine: 0.16 mg/dL (0.0-0.5 mg/dL ). Patient was hospitalized to investigate etiology of elevated erythrocyte sedimentation rate; including plasma cell dyscrasias. First of all, we planned direct X-ray images of the lumbar spine, blood smear and protein electrophoresis (PEP) to exclude plasma cell dyscrasias because of reversed albumin/ globulin ratio and complain of lumbalgia. There was no rouleaux formation or plasma cells on peripheral blood smear examination. Protein electrophoresis did not revealed monoclonal band formation. Similarly, serum and urine Immune Fixation Electrophoresis (IFE) were non-diagnostic. Patient was not given consent for bone marrow aspiration and biopsy. A CT scan of the abdomen revealed that liver and gallbladder were settled midline and stomach was located at the right side of the midline. Similarly, dysmorphic and multilobular structured spleen was also localized at the right side of the mid-line (Figure 1). CT scan also identified agenesis of pancreas head and uncinate process (Figure 2). Other findings of CT scan were as follows: reverse type intestinal malrotation (Figure 3), dilated left renal vein which connected with vena hemiazygos (Figure 4), inferior vena cava which continued with vena azygos (Figure 5). Figure 1: In abdominal CT, multi-lobed spleen parenchyma at the right side of the abdominal mid-line. 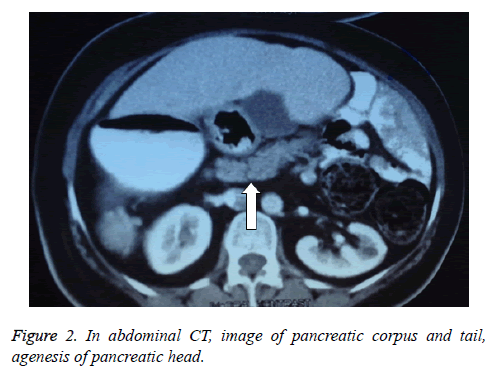 Figure 2: In abdominal CT, image of pancreatic corpus and tail, agenesis of pancreatic head. 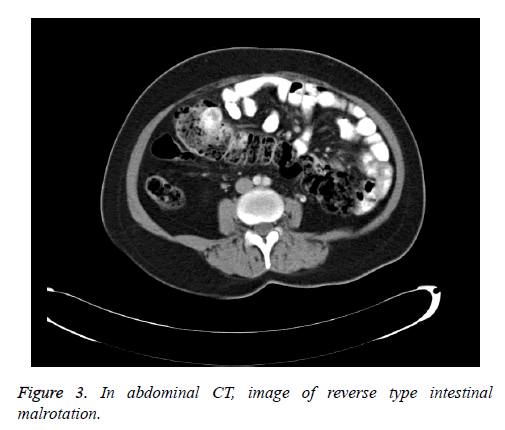 Figure 3: In abdominal CT, image of reverse type intestinal malrotation. 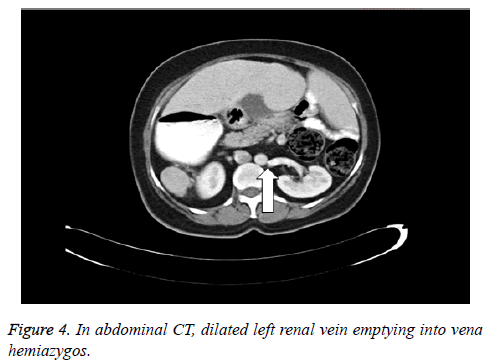 Figure 4: In abdominal CT, dilated left renal vein emptying into vena hemiazygos. 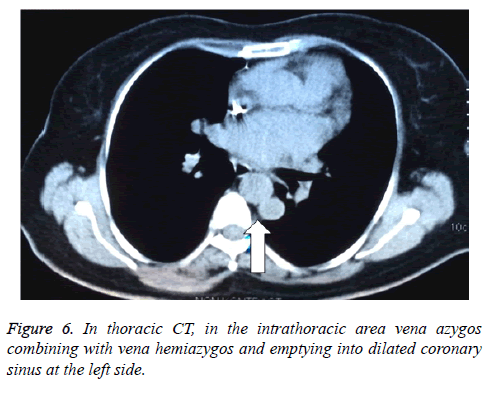 Figure 5: In abdominal CT, vena cava inferior is in continuity with vena azygos. Findings in thorax CT were as follows: localization of the heart was normal, vena azygos was connecting with vena hemiazygos at the level of T10-T11 and emptying into dilated coronary sinus with left brachiocephalic vein (innominate vein) at the left side (Figure 6), right brachiocephalic vein was directly emptying into the right atrium. Figure 6: In thoracic CT, in the intrathoracic area vena azygos combining with vena hemiazygos and emptying into dilated coronary sinus at the left side. We planned an endoscopic retrograde cholangio-pancreatography (ERCP) to localize ampulla wateri because abdominal CT failed to visualize the head of pancreas. MRCP imaging could not be done due to the cardiac pacemaker. However, we could not revealed ampulla in 2nd and 3rd parts of duodenum in ERCP. Intrahepatic bile duct caliber was normal in abdominal ultrasonography. Three lobulated spleen that have an activity enhancement of homogenous distribution was detected at the right side in splenic scintigraphy. No accessory splenic activity has been detected. Echocardiographic examination of the heart revealed pacemaker lead in right ventricle, degenerative changes in mitral valve, mild mitral and tricuspid insufficiency, and aneurism in interatrial septum. Heterotaxy syndrome is characterized with abnormal symmetry and malposition of thoraco-abdominal organs and blood vessels [1,2]. Two groups of abnormalities have been identified: right and left isomerism. Right isomerism is characterized with right lung anatomy on both sides (three-lobed lung, epiarteriel bronchial structure), absence of spleen (or polysplenia in rare cases), midline located liver, right or left sided stomach and gallbladder, adjacent position of abdominal aorta to inferior vena cava, and various frequent cardiac abnormalities. Cardiac abnormalities are common in asplenia syndrome, including transposition of great vessels, atrial or ventricular septal defects, truncus arteriosus, stenosis or atresia of pulmonary artery, abnormal venous return and atrioventricular conduction defects [2-6]. Left isomerism (polysplenia, bilateral left sidedness) is characterized with left lung anatomy on both sides (two-lobed lung, hyparteriel bronchial structure), midline liver, one and multi-lobulated spleen or multiple splenic formation in the abdomen, right or left sided stomach, malrotation of the bowels, atrial and/or ventricular septal defects, various degrees of heart conduction blocks, bilateral superior vena cava and continuation of inferior vena cava with vena azygos after interruption at intrahepatic level. However, thoracic and abdominal organs may participate in the pathology in varying degrees [1-7]. Present case is consistent with polysplenia syndrome because of multi-lobulated dysmorphic spleen located right side of the midline, continuation of inferior vena cava with vena azygos, emptying of dilated left renal vein into vena hemiazygos, and reverse type intestinal malrotation. Despite pancreatic duct anomalies are uncommon, dorsal pancreas agenesis cases have been reported in literature in polysplenia syndrome [5,8]. Unique feature of present case is the agenesis of head and uncinate process of pancreas, which has not been previously reported in literature. Embryological combination of the ventral and dorsal buds generate pancreas. Pancreatic head and uncinate process develop from ventral bud, while corpus and tail of pancreas develop from dorsal bud. Development of dorsal pancreas and spleen arise from dorsal mesogastrium, therefore splenic and dorsal pancreatic development abnormalities in common are seen in polysplenia syndrome [5,8]. Islet cells are usually located in tail and corpus of the pancreas. Thus, rate of diabetes mellitus have been increased in dorsal pancreas agenesis cases . Polysplenia syndrome with dorsal pancreas agenesis cases in literature had also diabetes mellitus [5,8]. Present case was not diabetic and dorsal pancreas was intact. However, despite great effort, we could not be able to localize ampulla vateri. Although the patient complained abdominal distention and constipation, she did not report steatorrhea, malnutrition and any nutritional deficiency, so we thought that wirsung and coledoc canal might drain into intestinal system, which we could not be imaged. Authors suggest the evaluation of upper gastrointestinal system in patients with heterotaxy syndrome when indicated . Evaluation of the upper gastrointestinal tract, nonetheless, should always be undertaken when indicated. Therefore, we did not consider further imaging techniques after ERCP failed to show ampulla wateri in present asymptomatic case. In conclusion, present case report is important because, to our knowledge, it is the first in literature that reported agenesis of head and uncinate process of pancreas in a patient with polysplenia syndrome. Dilli A, Gultekin SS, Ayaz UY, Kaplanoğlu H, Hekimoğlu B. A Rare variation of the Heterotaxy Syndrome. Case Reports in Medicine 2012; 2012: 840453. Shiraishi I, Ichikawa H. Human Heterotaxy Syndrome-From Moleculer Genetics to Clinical Features, Management, and Prognosis. Official Journal of the Japanese Circulation Society. 2012; 76: 2066-2075. Wolla CD, Hlavacek AM, Schoepf UJ, Bucher AM, Chowdhury S. Cardiovascular manifestations of heterotaxy and related situs abnormalities assessed with CT angiography. NIH Public Access. 2013; 7: 408-416. Casey B. Two Rights Make a Wrong: Human Left-Right Malformations. Human Moleculer Genetics. 1998; 7: 1565. Low JP, Williams D, Chaganti JR. Polysplenia syndrome with agenesis of the dorsal pancreas and preduodenal portal vein presenting with obstructive jaundice-a case report and literature review. 2011; 84: e219-e222. Mahalik S K, Khanna S, Menon P. Malrotation and volvulus assosiated with heterotaxy syndrome. Journal of Indian Association of Pediatric Surgeons. 2012; 17: 138-140. Fukuda K, Onda T, Kimura Y, Miura S, Matsumori R, Masaki Y, Nishino A, Inoue K, Fujiwara Y, Sumiyoshi M. An adult case of polysplenia syndrome associated with sinus node disfunction, dextrocardia, and systemic venous anomalies. Intern Med 2015; 54: 1071-1074. Kapa S, Gleeson FC, Vege SS. Dorsal Pancreas Agenesis and Polysplenia/Heterotaxy Syndrome: A Novel Assosiation with Aortic Coarctation and a Review of the Literature. JOP J Pancreas. 2007; 8:433-437. Jeong JH, Kim GH, Song GA, Lee DG, Moon JY, Cheong JH, Kim S. Polysplenia Syndrome with Congenital Agenesis of Dorsal Pancreas Presenting as Acute Pancreatitis and the Role of Endoscopic Ultrasonography in Its Diagnosis. Korean J Gastroenterol 2012; 60: 47-51. Loomba R, Shah PH, Anderson RH, Arora Y. Radiologic Considerations in Heterotaxy: The Need for Detailed Anatomic Evaluation. Cureus 8.